A powerful Pacific storm wreaked havoc on Friday morning’s commute, contributing to dozens of spinouts, hydroplaning incidents and other crashes throughout San Diego County. As of 8 a.m., 116 crash reports were received by the California Highway Patrol, which normally handles about 50-75 crash reports during a full, 24-hour fair weather day. A total of 52 crash reports were received before 6 a.m., leaving 64 crash reports called in during the height of morning rush hour, the CHP reported. No one was seriously injured in most of the crashes. 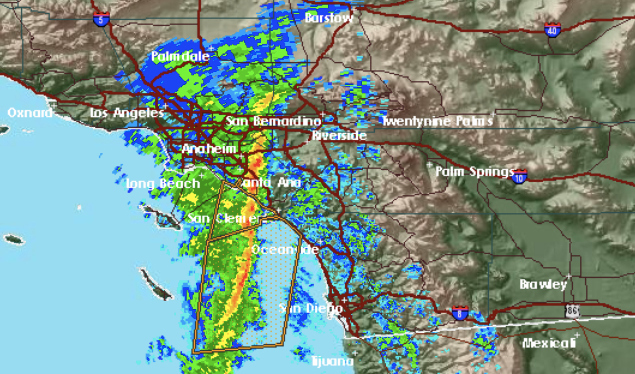 The National Weather Service reported at 7 a.m. that since Thursday evening, 0.49 inches of rain had fallen in Oceanside; 0.32 in Escondido; 0.10 in Clairemont; and 0.16 at Lindbergh Field. Also reported was 0.52 inches at Palomar Mountain and a whopping 1.1 at El Capitan Dam. The weather service said showers and strong winds will continue into much of the weekend, though the heaviest rainfall is expected this morning into this afternoon, with rainfall rates in excess of one inch an hour possible today. The agency also said thunderstorms were possible today. A flash flood watch was in effect until late Saturday night for coastal, valley and mountains areas. Mountain areas near where the Chariot, General and San Felipe fires occurred are especially susceptible to debris flow.